Steven Spielberg's fanciful science-fiction Pinocchio-fable starred Haley Joel Osment as the robot android boy David. Its tagline was: "David is 11 years old. He weighs 60 pounds. He is 4 feet, 6 inches tall. He has brown hair. His love is real. But he is not." He was programmed with human emotion as a robot of the future (Mecha, short for "mechanical"), with an imprinted ability to express loving desire for a mother. The film also presented a very dystopic view of the future. Its nomination for Best Visual Effects, along with Pearl Harbor (2001), lost to the Oscar winner The Lord of the Rings: The Fellowship of the Ring (2001). The film's special effects used a combination of dozens of practical real-world models and computer-generated models. For example, the talking Teddy Bear character was a complex combination of animatronic puppetry (of the many full-sized models constructed, one had servo-motors in its face for its talking and movement) and digitizing. When a cryogenically-frozen Martin was brought out of a state of suspended animation and was recovering, and there were instances of sibling rivalry, David and Teddy Bear were 'abandoned' for fear that he would be destroyed if returned to Cybertronics. David went on an odyssey, believing that he could return once he became a "real live boy." As in the Pinocchio tale, David was in a state of delusion and denial, and believed that the Blue Fairy had the power to turn him into a real boy. For some time, David partnered with newfound friend Gigolo Joe (Jude Law), a mecha designed for companionship. Rouge City, a Las Vegas-esque resort, was one of the most complex sets to design and build. Some of the City's buildings were built to scale, while others were created digitally and filmed on a special virtual blue screen stage. The blue screen set was unique in that it was designed as a virtual digital environment in which actors could walk through a set and be seen 360 degrees on a monitor which housed all the surrounding scenery in sync. Another of the F/X innovations was the blue field masking of some parts of the robots that were later enhanced by computer imagery. For example, the FemMecha Nanny (Clara Bellar) turned sideways to the camera, revealing a hollow or translucent face full of machinery. Other CG characters included the 'Specialists' - a highly-advanced form of scientist Super-Mechas or beings many hundreds of year in the future - translucent, slender and graceful robots with glasslike features, elongated necks, and super-imposed faces. Miniatures and CGI were extensively used for the final sequences of the film set 2,000 years into the future in a surreal, underwater New York City. Many digital enhancements were employed to create the underwater and ice sequences in a world that had drowned in sea water due to melting ice caps from global warming. The character of the Blue Fairy (voice of Meryl Streep) (represented by a submerged Coney Island statue in the amusement playground), was another CGI creation. In the final scene, Teddy Bear climbed up on the bed where David (who had been unfrozen and thawed, and represented extinct human civilization) was sleeping - and happily reunited next to his cloned mother for just one final day. This science-fiction tale by director Hironobu Sakaguchi (creator of the best-selling series of interactive video games that inspired the film) was hailed as the first CGI animated full-length film to have photo-realistic, life-like characters. It was also the first hyper-real, fully computer-generated (CGI) feature-length film based entirely on original designs - no real locations, people, vehicles, or props were used. And it was the first feature film to use motion capture to create realistic digital humans. Set in the year 2065, the sci-fi adventure depicted the earth under siege from strange ghost-like alien forces. It was soundly criticized for offering a boring, solemn and needlessly-complex storyline about how to deal with the alien life forms. It took four years to produce by a team of 200 digital artists who were engaged in the making of Final Fantasy, advertising itself as "Fantasy Becomes Reality." The team of 200 artists contributed about 120 person-years of work. Rendering was accomplished by 960 computer workstations. The film itself was composed of 1,327 shots. A shot would be built with anywhere from nine to 498 composite layers! There were 141,964 frames, each of which took anywhere from 15 minutes to over 7 hours per frame to render. The average was around 90 minutes. Square Pictures stored 10 Terabytes of 3D and 5 Terabytes of 2D artwork. Its production budget was estimated to be $137 million, with box-office of only $32 million gross income (domestic) and $53 million (foreign) - $85 million total, making it a box-office failure. Obviously, it turned out to be an overly-ambitious attempt to bridge the rapidly-closing gap between videogames and films. Final Fantasy was the most expensive video game-inspired movie ever made - and also one of the least successful video game-inspired movies ever made. The massive losses caused the bankruptcy of its Honolulu-based production studio, Square Pictures. The most complex CG human character ever created was Dr. Aki Ross (voice of Ming-Na), who was reported to have 60,000 individual strands of hair. The amount of detail rendered into hair, clothing, skin texture, eyes, and movement was astounding and impressive. To make the synthetic actors more real, they were made to look imperfect - with acne, freckles and pores. Characters' faces and skin included such details as liver spots, wrinkles, veins in a clenched hand, individual hair strands, and so forth. However, Dr. Aki Ross' curvaceous figure was enough to cause her to be featured, as a bikini-clad CG image, on the pages of Maxim, a men's magazine. Some actors, such as Tom Hanks, however, expressed worry that such realistic technology might enable unscrupulous film-makers to illegally use an actor's image, or use a digital clone to tamper with an actor's existing performances. This was the first CGI feature length film produced by Nickelodeon and made by DNA Productions of Dallas, Texas. As a spin-off, it became computer-animated TV series created for the Nickelodeon Channel from 2002-2006. It was nominated the first year the Academy Awards offered the category of Best Animated Feature Film, but lost to Shrek (2001). The animated sci-fi comedy was the first computer-generated feature film from a major studio to be created solely with off-the-shelf hardware and software that any consumer could buy. The animation was created with NewTek's LightWave 3D® animation software that created, modeled, rendered and textured the film. Rather than having the sophisticated polish of the Pixar/Disney animations, however, it was more cartoonish and looked like a fun computer game. The very creative story was about a 6th grade 'boy genius' whiz-kid, who was good at inventing things - a shrinking ray, a robot dog named Goddard (that pooped nuts and bolts), a satellite communications system (out of a toaster), etc. He was called upon to outwit slimy green Yolkian aliens flying in egg-shaped capsules, when all the parents in town were kidnapped (and were going to be fed to the Yolkian goddess Poultra - a chicken-like monster with three eyes). Jimmy constructed a rocket and utilized other space vehicles from the rides at Retroland, flew into space to the alien planet of Yolkus ruled by King Goobot V, and saved the day. New Zealand director Peter Jackson's trilogy of fantasy adventures, based upon the Middle Earth books by J.R.R. Tolkein, was the three-time Oscar winner for Best Achievement in Visual Effects for three consecutive years. In each of the years of the award, this film series franchise defeated A.I. : Artificial Intelligence (2001), Pearl Harbor (2001), Spider-Man (2002), Star Wars: Episode II - Attack of the Clones (2002), Master and Commander: The Far Side of the World (2003), and Pirates of the Caribbean: The Curse of the Black Pearl (2003). The film resulted in a total of 17 Oscar Awards, and $2.9 billion at the box-office (worldwide). 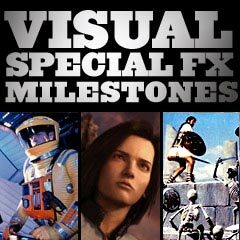 There were almost 2800 visual effects shots in all three theatrical films. The main effects included motion-capture, computer-animation, compositing, miniatures and models, matte paintings, and camera effects (ie., forced perspective). In the first segment, The Lord of the Rings: The Fellowship of the Ring (2001), a special effect known as forced perspective was used to make Gandalf (Ian McKellen) appear more giant than the little hobbits. Gandalf was always much closer to the camera to create the effect. Another technique used in conjunction was to have multiple, different-scaled sets. There was also an impressive stand-off fight between Wizard Gandalf and the fiery Balrog (Durin's Bane) on the Bridge of Khazad-Dum in the dark Mines of Moria. Gandalf cried out: "You shall not pass!" and then collapsed the bridge under Balrog, but the creature wrapped its fiery whip around one of Gandalf's legs, taking the wizard down into the chasm with him. As he fell, he called out to the fellowship: "Fly, you fools!" In the second part of the trilogy, The Lord of the Rings: The Two Towers (2002), CGI-imagery was combined with "motion capture" (of the movements and expressions of actor Andy Serkis, who also served as the voice) and puppets to produce the supporting character of the insane, ring-addicted Gollum (originally known as Sméagol) - noted for saying: "Myyy PRECIOUSSS!" It took more than 1,000 drawings and 100 sculptures to design the character of Gollum. A motion capture suit recorded the actor's movements that were then applied to the digital character. A more laborious visual effects process digitally "painted out" Serkis' image and replaced it with Gollum's. Another major special-effects character was a talking-walking tree (Ent) named Treebeard - a combination puppet and CGI-character. Also in The Two Towers (2002), AI-driven agents were used to create the digital army scene in which evil wizard Saruman (Christopher Lee) surveyed the troops (numbering 10,000) at Mordor before him - before they marched and attacked at the climactic battle at Helm's Deep. Even larger numbers of troops were digitally created for the massive siege of Minas Tirith, the Battle of Pelennor Fields and the battle at the Black Gates of Mordor in The Lord of the Rings: The Return of the King (2003). The third segment of the trilogy included more special effects shots than any of the other segments. It won the MTV Movie Award for "Best Action Sequence" - the actual attack, the 40-minute middle section of the film. The loud and booming film with frantic, fast-clipped editing, also won one Oscar - Best Sound Editing. However, some criticized the account as factually inaccurate in places. Many of the re-enactment scenes were digitally created (mostly with miniatures and CG), including hundreds of World War II era airplanes, battleships and vehicles, sailors, along with tracer fire, pyrotechnics, and smoke from dozens of explosions. This fully computer-animated, colorful fantasy film (from DreamWorks and Pacific Data Images - PDI) was the first Oscar winner in the newly-created category of Best Animated Feature, by the Motion Picture Academy of Arts and Sciences. It took a film production crew of over 275 to create the film over a three year period. There were a total of 31 sequences and 1,288 shots, with very believable characters and natural backgrounds, textured clothing and realistic movements. Creating the world of Shrek ultimately involved 36 separate in-film locations, which DreamWorks claimed was more than any previous computer animated feature. Although Shrek was originally planned to be a live-action/CG-animated hybrid with motion-captured main characters, it became fully computer-animated. The film featured the most advanced CGI liquid and fire effects at the time, in the scenes with the fire-breathing Dragon. PDI proprietary software was used to create the dynamic fur, ears and tail of the Donkey. The realistic-ness of the characters was actually scaled back to have a more "cartoony" look. DreamWorks used a "proprietary" photo-realistic facial animation system (first used in Antz (1998)) - a layering process to build the image of a character's face, starting with the skull and then gradually adding computer re-creations of muscles and skin. The image was wired with hundreds of controls to allow for a huge number of facial expressions, shapes, movements, dialogue and realistic lip-syncing. One of the film's realistic touches was two small beauty marks on Fiona, one on her left cheek and one on her upper chest. Director Pitof's dark 19th century crime fantasy was the world's first-completed theatrical feature film shot entirely on Hi-Def digital video. There were an astonishing total of 2,300 shots (put together in an erratic, rapid-fire editing style), including 800 digitally-modified in post-production. This first full-length, all-digital film was shot using a Sony HD-CAM 24P1 (1080p, 24fps) high-definition digital camera, producing astonishing visuals. The new technology was used to create fantastic cityscapes and landscapes of the 1830s Paris. However, it was also dark, grainy, and sometimes blurry in the many close-up shots. It told the 19th century Parisian story of a famous detective named Vidocq (Gérard Depardieu), a French Sherlock Holmes, searching for his nemesis, a mysterious assassin known as the Alchemist - a ninja-like character wearing a flowing cape and a circular mirrored mask. The killer believed he gained the power of eternal youth by sucking out the souls of his victims. The deaths of two wealthy and high profile business men had already occurred. The Alchemist was ultimately revealed, in the film's plot twist, to be Vidocq's own biographer, a young journalist named Etienne Boisset (Guillaume Canet). This animated, R-rated ground-breaking experimental film was writer/director Richard Linklater's sixth film. It provided both a rotoscopic dream world, and a very weighty, intellectual discourse on life. It was first digitally shot on a mini-digital video camera as a live-action film, and then edited normally, complete with double-exposures and composited effects. In the next step, 30 artists graphically 'painted' the characters via computer (with a process called "interpolated rotoscoping") to create the illusion of a cartoon in motion. The animation was then transferred to celluloid, producing a hyper-real, stylized comic-book look. The results often varied, sometimes appearing like sketchpad drawings, or super-realistic paintings, comic strips, lino prints or graffiti art. Jesse conversed with her: "I’ve been thinking about something you said," and reminded her of an earlier statement she had made that she felt like she was observing her own life from the perspective of an old woman about to die. She confirmed: "I still feel that way sometimes. Like I'm looking back on my life, like my waking life is her [the old lady's] memories." They also went off on a tangent, discussing Timothy Leary, brain chemistry and activity after death, and the compression of time in dreams. The two concluded with the idea that reincarnation was a poetic metaphor for the idea that people share a common spiritual background or collective memory: "It's like we're all telepathically sharing our experiences." Director Jacques Perrin's incredible bird documentary was famed for its almost complete lack of optical visual effects (for the bird footage) and some of the best camera work ever done in film history. The extraordinary nature film was shot on seven continents over a period of four years, using five crews of more than 450 people (including 17 pilots and 14 cinematographers). Filmmakers used several remote controlled and conventional planes, helicopters, hot-air balloons, ultra-lights and para-gliders to film the awe-inspiring flying birds close-up. There were an unending series of completely astounding aerial footage sequences in which a moving camera followed migratory birds for thousands of miles. Sometimes, the birds flew in perfect formations, communicating with each other with urgent cries and squawks. This 20th James Bond espionage thriller helped to put the final nail in the coffin for the series for awhile. The action film was universally regarded as inept and full of mistakes and missteps. Some surmised that a resurrection would have to occur. It took four years - and new recasting - to save the James Bond franchise from oblivion. A major mistake in one of the action sequences was the death-ray seeking, tsunami-surfing, glacier dodging sequence. It had preposterous-looking and poorly-executed CGI, with a shoddy green-screen effect, with Bond's artificial CGI-body. In the scene, Bond (Pierce Brosnan in his fourth and last appearance) was chased as he tried to outrun an Icarus satellite laser beam across ice. He steered the dragster toward a sheer cliff face, and ejected a rope anchor just before going over the cliff. He then scrambled out onto the dragster and grabbed the emergency parachute from the dragster's compartment panel. He used both the chute and the panel to create a life-saving surfboard-kite when the ice glacier beneath collapsed, broke off, and fell into the ocean, triggering a massive tidal wave. He surfed over the icy water, maneuvering around chunks of the glacier (an iceberg tsunami), before reaching the other side. There were numerous upgraded digital 'enhancement visual effects' and completely remixed audio made to the original 1982 version of this Steven Spielberg film, for the Millennium Edition (20th Anniversary). These modifications followed the trend of the times - to alter films slightly upon their re-release, as was also done with The Exorcist (1973) and The Exorcist: The Version You've Never Seen (2000), Apocalypse Now (1979) and Apocalypse Now Redux (2001), and Star Wars (1977) and Star Wars: The Special Edition (1997). Most of the enhancements rendered the friendly animatronic alien in the original as a computer-animated figure. E.T. was remodeled digitally so that his movements were more fluid, and facial expressions were more emotional (i.e., in the scene in which E.T. watched a Tom & Jerry cartoon, he expressed shock at the violence). This allowed E.T. in an extended bathroom scene with Elliott (Henry Thomas) to be seen underwater and blowing bubbles in the bathtub, among other minor tweaks. There was new footage in the scene of Elliott's mother Mary (Dee Wallace) searching for her children in town on Halloween. Another minor change was that the line: "You are not going as a terrorist!" was changed to "You are not going as a hippie!" when Elliott's mother forbade her son to wear a 'terrorist' trick or treat costume. One notable PC-friendly change was that the guns in the hands of FBI agents at the road-block were miraculously changed into walkie-talkies, and one brief image of a shot-gun was excised. Director Sam Raimi's blockbuster comic-book hero feature film was the first in the director's trilogy of the Marvel comic character with spider-like super-powers. Star Wars: Episode II - Attack of the Clones (2002) and Spider-Man (2002) were both nominated for Best Visual Effects, but lost to Peter Jackson's The Lord of the Rings: The Two Towers (2002). It was the tale of how ordinary, nerdy urban adolescent Peter Parker (Tobey Maguire) was transformed into big-city crime fighting Spider-Man after being bitten by a genetically-altered superspecies of spider. Scientist Norman Osborn (Willem Dafoe), the head of the "human enhancement" corporation Oscorp, was transformed into the metal body-armored Green Goblin who flew around NYC on a rocket-powered surfboard and caused havoc, while Norman's son, Harry (James Franco) took the role of Peter's best friend and was also Peter's personal rival for Mary Jane Watson's (Kirsten Dunst) affections. Segments with Spider-Man required shooting in front of a greenscreen, while the villainous Green Goblin had to be shot in front of a bluescreen. The superhero film also included the extensive use of digital body doubles and the digital removal of wires, cables and rigs from many continuous motion shots of Spidey somersaulting and ricocheting amid the tall skyscrapers. Almost every car in the original film shots had to be removed and replaced with digital models. In the CGI-enhanced Costume Montage sequence that lasted about a minute, over 40 live-action and graphic elements were combined as Spider-Man brainstormed to create a costume for himself. And in respect for the 9/11 tragedy, the shot of the World Trade Center's Twin Towers, between which Spider-Man had spun a web to snare the maniacal Green Goblin and caught a passing helicopter instead, was removed from the final cut of the released movie (in its final reel), although the image remained in one of the film's teaser trailers. The exciting final battle between Spidey and the Goblin was relocated from the Twin Towers to the Queensboro Bridge. In the exciting set-piece following the abduction of MJ by the Green Goblin, she was endangered in a gondola-tram car full of children on top of the Queensboro Bridge. Spider-Man miraculously saved everyone and, in a final one-on-one matchup in a deserted building, was able to impale the unmasked, double-crossing Green Goblin through his mid-section against a brick wall with his own razor-sharp glider blades. In order to ensure a PG rating, digital effects transformed the red blood from the hero's mouth into clear liquid spit. George Lucas' epic film was the fifth film in the series, and the second film of the prequel trilogy. The previsualizing storyboards for the entire film were digital animatics mock-ups as opposed to traditional storyboard techniques, to provide a fast and fairly accurate preview of how the scenes would look and feel. Basically, they provided a shooting schedule for how the film would be composed. Practical model-making with digital matte painting techniques were combined in a number of scenes, including the Naboo country picnic scene between Anakin and Padme. The waterfall cliffs in the background were constructed with painted aluminum and then photographed outside. The foreground meadow was manipulated, enhanced, and combined with digital video footage of the background and the waterfalls. The most controversial new feature was a completely CGI-created version of the character Yoda. During the lightsaber duel between Count Dooku (Christopher Lee) and Yoda, a stunt double was used (with actor Lee's face superimposed on all shots except the close-ups). During the rehearsals for the scene, a small Yoda model was put in place for Christopher Lee to use as a reference.